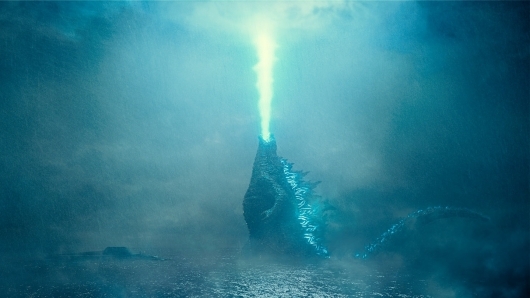 “Long live the king.” Ever since Godzilla: King of the Monsters was confirmed, many wondered who the king of the monsters would be facing next. It turns out, it’s not just a one-on-one fight, but a battle royale. That’s because Godzilla is facing off against some of his greatest kaiju adversaries: Mothra, Rodan, and his ultimate nemesis, the three-headed King Ghidorah. The film has been in production for a while, with Warner Bros. scheduling the long-awaited sequel for a May 2019 release. Now the wait for that first look is over. While at San Diego Comic-Con, the cast and crew were there to talk about the film, and also present a new trailer. And boy, does it set the tone. Check out the first trailer for Godzilla: King of the Monsters below. This trailer. This one trailer. It definitely sets the tone. The shots of massive beasts trying to establish their dominance over the puny humans are breathtaking. But what brought these monsters out of hiding? Well, apparently, Monarch is looking for them, and if they aren’t found, the planet will perish. The scale of everything left me at a loss for words. That use of “Claire de Lune” was absolutely ingenious as it was the perfect dichotomy of sincere peace against raging monsters. I honestly cannot wait to see this trailer again but in an actual theater. But perhaps the most interesting thing about this is that director Michael Dougherty looks like he was able to find that balance of human emotion and monster mashing. In it, we get to see that Dr. Emma Russell (Vera Farmiga) is forced to make some pretty tough choices, choices that will have a profound impact on her husband (Kyle Chandler) and daughter (Millie Bobby Brown). Ken Watanabe, Sally Hawkins, Bradley Whitford, Thomas Middleditch, Charles Dance, O’Shea Jackson Jr, Aisha Hinds, and Zhang Ziyi also star. Godzilla: King of the Monsters opens in theaters on May 31, 2019. Click right here to find much more from San Diego Comic-Con 2018!